Swim to Atlantean Islands - you can swim to Atlantean Islands only with the Swimming Buoy. 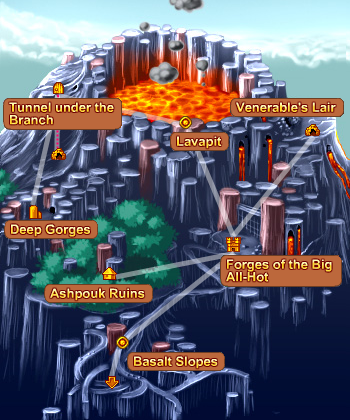 Climb up to Lavapit - you can climb up to Lavapit only with the Climbing Gear. Go to Twilight Cementery - you can go to Twilight Cementery only when your Dinoz health is below 10 or when your Dinoz have Skully Souvenir. 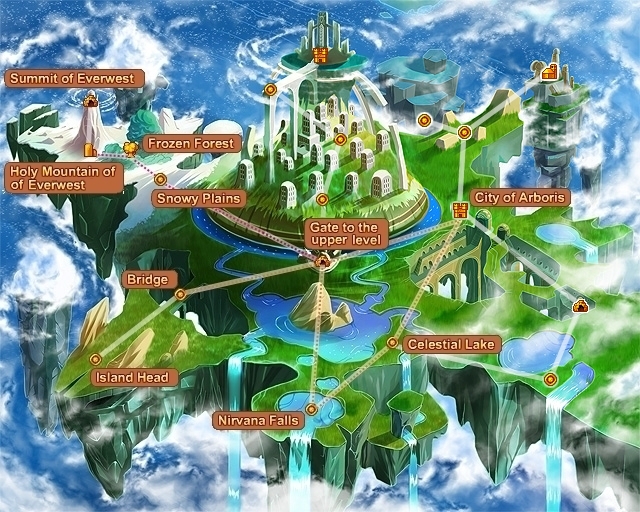 Go to West - you can go West only when you have visited Atlantean Islands and Lavapit after talking to Michael the Guide. Sale to Monster Island - you can sale to Monster Island after you give Joveboze a Warm Bread. Call a Scorpscuba - you can get to Underwarer Dom only with the Scorpscuba Caller. 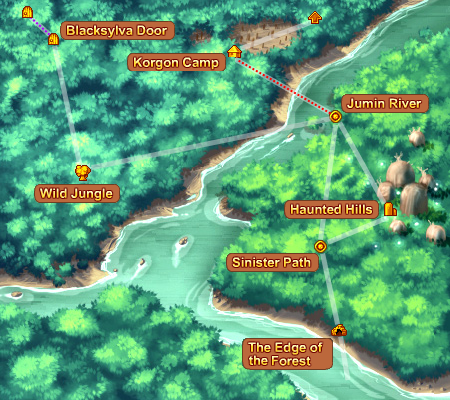 Go past the Falls - you can go past the Falls to Grumhel Forest only with Zor's Glove and the Waterlilly Pads. Go to Totem Island - you can go to Totem Island only when you finished Kabuki Quest. 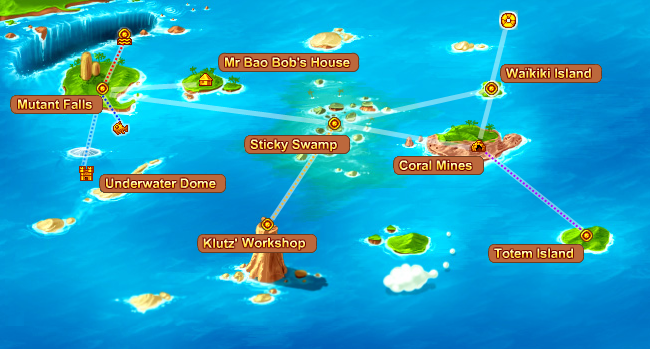 Go to Klutz' Workshop - you can go Broc's Workshop while Celeste Island Quest. Enter the tunel - you can always enter the tunel, but only with Lantern, you can reach Deep Gorges. 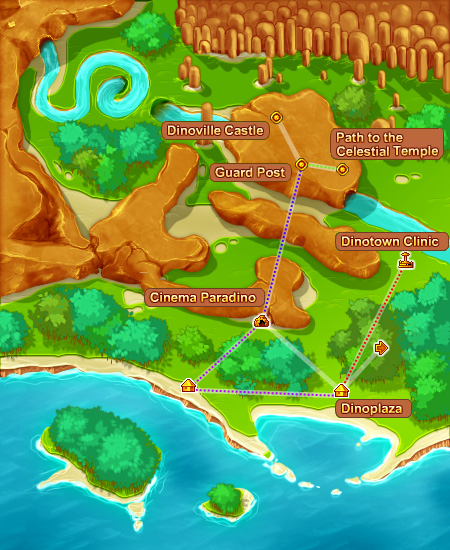 Go to the Clinic - you can go to the Dinotown Clinic only when you You are a member of the clan which build Clinc, and you unlock Clinic location. 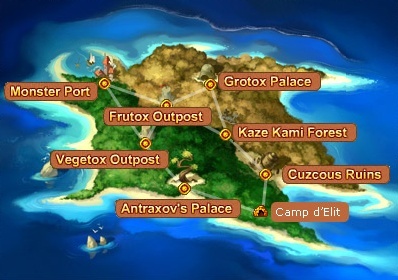 Go to Villa - you can go to Villa while Celeste Island Quest. 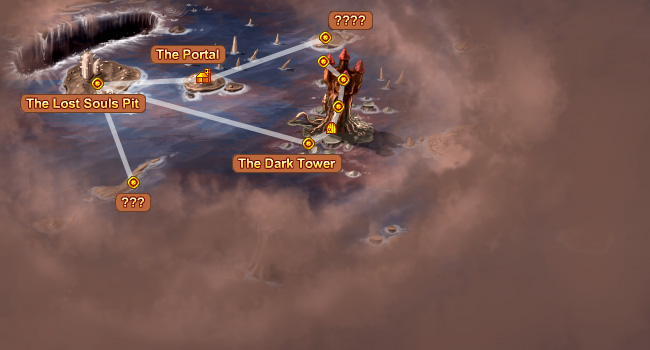 Go to Guard Post and Dinotown Castle - you need Dark World Fragment - see Gulom missions. Cross the river - you can cross the river only with Korgon Fins. Go to Magnetic Stepes - you can go to Magnetic Stepes only with Blacksylva Key. To get to the Dark World, you must gather 7 dinoz with Korgon Fins at Mr. Bao Bob´s place. Those can be your dinoz or dinoz of your other clan members. Talk to Mr. Bao Bob and have the dinoz start focusing via conversation option. Once 7 dinoz have focused, the portal to Dark World will open. For more details see Dark World page. 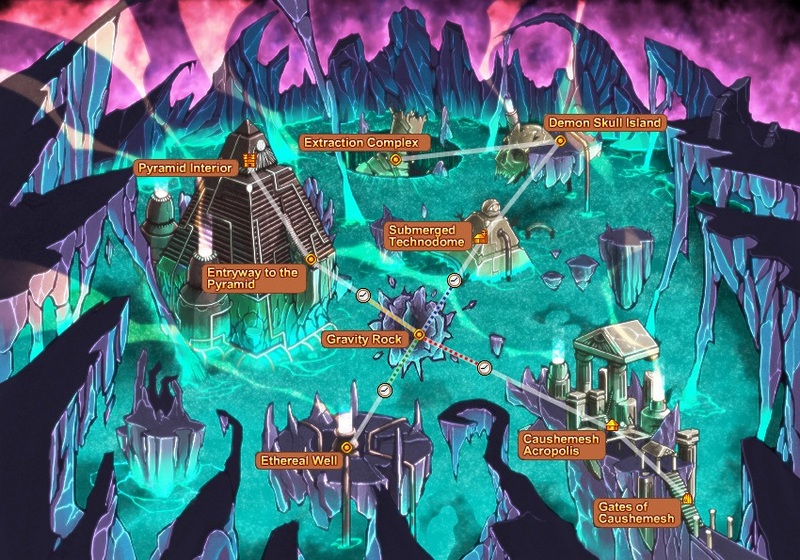 The region can be accessed from Blacksalvya door in Grumhel Forest after you obtain the Blacksylva Key in Dark World (see above). To access the Steppes border outpost - you must finish the Rockies King quest, and obtain the Negative Lodestone Shard, so you can approach the Siphon. To access the Caushemesh - you must finish the first part of Caushemesh quest. 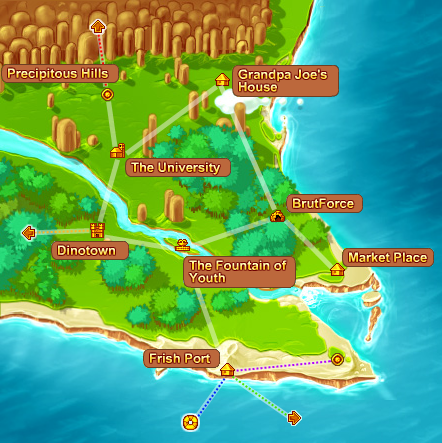 The region can be accessed from Frish Port after you give Joveboze a Warm Bread. For more details see Monster Island page. Go to the Gate to the Upper Level - you have to infiltrate locations before you will be able to move normally between them. Go to the Snowy Plains - you need to know the WORD and talk with Chen in City of Arboris before you will be able to infiltrate more locations. For more details see Celestial Island of Nimbao page. 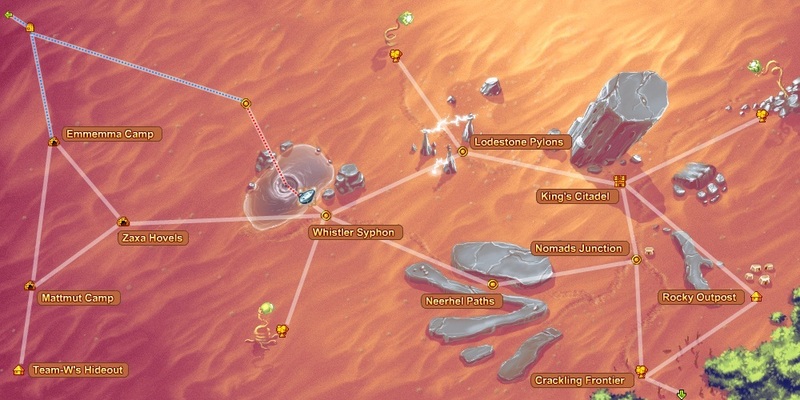 Gravity of rhe Rock - every 15 min, the rock delivers a new destination. The order of the rock appears to change depending on the day, it will be up to you to find the right time depending on the day. For more details see Caushemesh page.